Driven by the need to escape the brutal cold of December 1777, the Continental Army arrived at Valley Forge and immediately prioritized shelter for its 12,000 soldiers and camp followers. Out of necessity, they turned to the trees. The math is staggering: A virtual city of huts, each structure taking 80 trees, arose in a matter of weeks. In addition, the accessible forestry was also used for defense structures, fires and other supplies. Amazingly, however, not every tree at Valley Forge was felled during Washington’s stay. 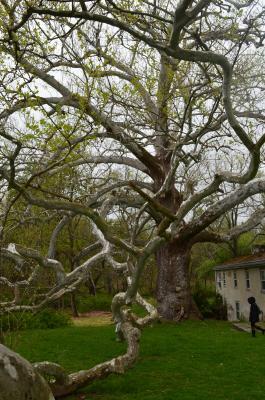 One of the most impressive survivors, the Pawling Sycamore, still stands, and apropos of Arbor Day 2017 (Friday, April 28), here is its story. That timeline would imply that the tree shared the landscape with the Continental Army. Some have therefore classified it as a “witness tree,” a distinction given to forestry present at key events in American history. 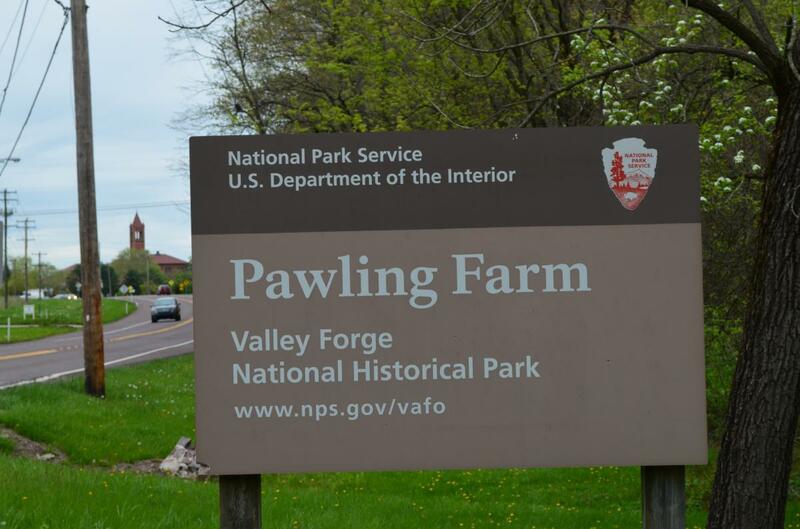 Amy Ruhe, Valley Forge National Historical Park Natural Resource Manager, is reluctant to attach that distinction to it, absent a definitive date for when it took root. “Most people know that dating a tree involves cutting it and counting rings,” she says. “An alternative method is known as ‘coring,’ where a plug of wood is removed and analyzed, with the age of the tree being estimated that way. “But coring is incredibly invasive. It often leads to disease or even the death of the tree. Ruhe says, however, that its location in the park, in close proximity to a spring, may have led to its longevity. Some sources conjecture that the tree survived the Continental Army because sycamore wood is unfit for burning. Ruhe doesn’t hold that position. “If it could be burned, Washington probably burned it,” she explains. I went to see the Pawling Sycamore for myself. I turned into the farm’s driveway and navigated the bumpy gravel road. Parking was easily located; the tree less so. I luckily happened on a hiker – a woman in a red coat who emerged unexpectedly from the woods, walking her beagle. She pointed the way. The pathway to the sycamore takes several sharp turns, leading walkers by remnants of the former estate of the Pawling and Wetherill families. 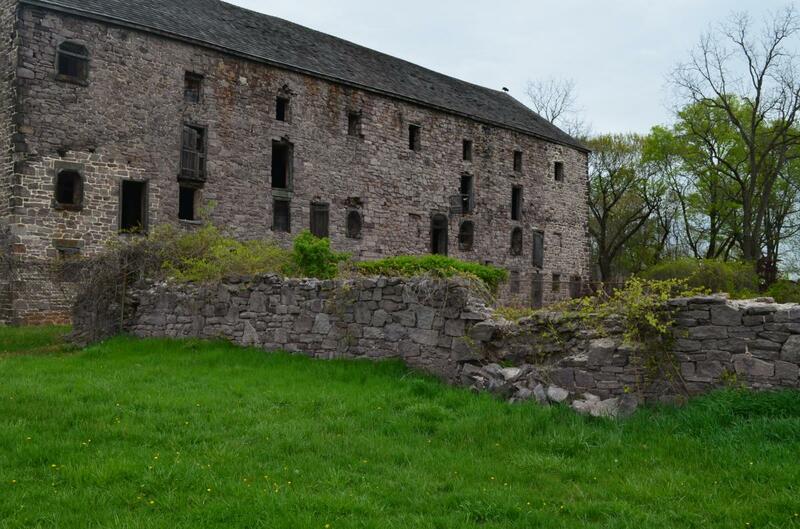 The former owned the property, known as Walnut Hill, beginning in 1743, the latter in 1826. As I continue to walk, the tree becomes visible. From a distance, the white branches look as if some prehistoric creature became ensnared there, eventually leaving only a network of bones. 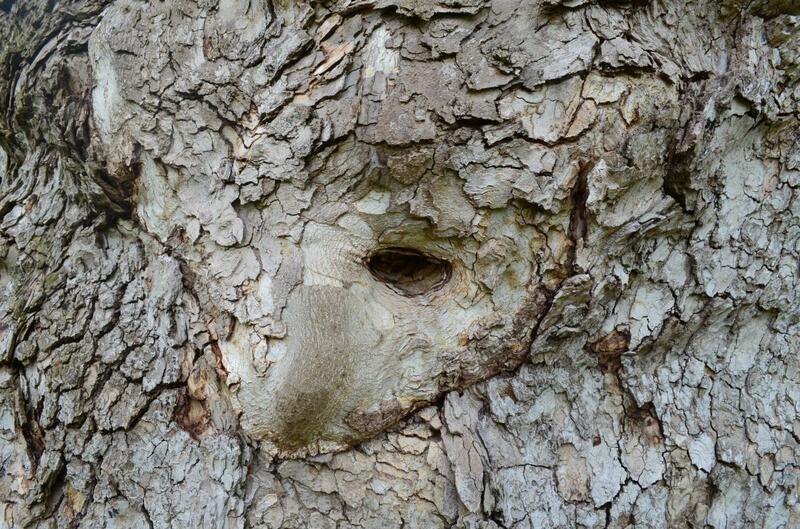 Up close, the gnarled trunk plays with the imagination, and it’s possible to envision mystical faces on it. The branches – some as thick as trees themselves – spread outward in all directions, their weight forcing them to the ground where they have become permanently stuck. On closer examination, they show dots of green emerging at the tips: the return of leaves with the spring. 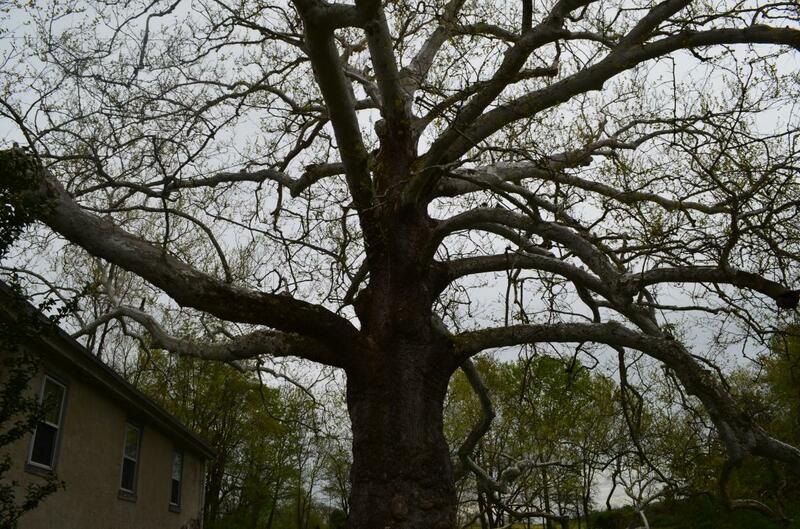 The Pawling Sycamore, like the rest of nature, is awakening for another spring and summer. Just as it has for centuries, possibly since the time when our seeds of liberty were first sown, yielding the United States of America.